WCVE was lucky to have so many of our wonderful listeners share their talents for our 2019 Spring mug design contest. Thank you to everyone who took the time to share your love for WCVE in creative and meaningful ways. Your listenership and support means the world to us! Grab a cup of coffee with WCVE at one of our Mug Stops during our FM Pledge Drive from April 22-26. The following interview with mug artist Lathan Gordon was edited for clarity and brevity. After reviewing over 76 submitted works, WCVE chose Lathan Gordon’s creative illustration as our Spring 2019 design. 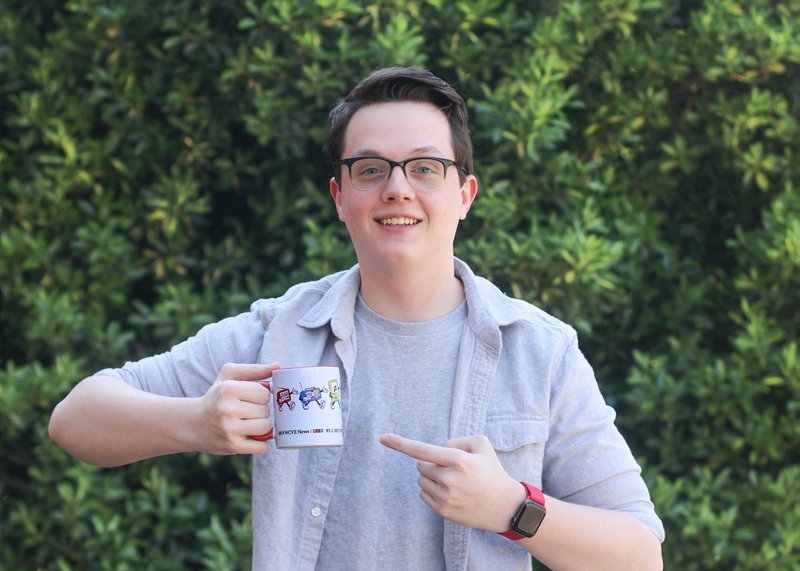 Gordon, a 17-year-old senior at Atlee High School, heard about our mug design contest from his teacher, Erik Leise, just two days before it ended. “I am an avid WCVE listener. When I heard about the contest, I mentioned it to my AP classes. We had a few students that wanted to enter. Lathan is always looking for design contests to enter. He told me about his idea and I thought it had a really good chance at winning,” Leise said. Gordon’s retro-style concept utilizes primary colors, drawing inspiration from classic cartoons. Although he’s our youngest ever design winner, Gordon has been studying graphic arts for almost five years and has won other design contests, including the Graphic Arts Education and Research Foundation infographic contest, the Richmond Crime Stoppers poster contest, and a variety of academic competitions. When he’s not creating logos and infographics, he participates in his school’s Art Guild club, and serves as the communications officer and publicist for his school’s film club. Gordon’s 2019 Spring mug will be available only at designated Mug Stop locations from April 22 - 26 during WCVE’s Spring 2019 Pledge Drive. WCVE: What inspired your design? Lathan Gordon: I really love the classic “Steamboat Willie” cartoon, and I think anybody at any age can appreciate how familiar and original it is, so I wanted to create something that shows how WCVE also achieves a similar appeal. The different characters and colors represent how WCVE reaches all sorts of audiences, and how people listen in a bunch of different ways. WCVE: What do you enjoy most about graphic design? LG: I really love the challenge of portraying a message through a medium that people tend to overlook. I think a lot of people really don’t understand how graphic design is everywhere and influences everything around you. So I really like being part of that, and trying to show people things or solutions they wouldn’t normally think of. WCVE: How has your design teacher, Erik Leise, inspired you? LG: He’s cool, he always pushes his students to do things that they wouldn’t normally do, and he really cares about us. He just really connects with us, and is really good at what he does. WCVE: What do you love most about public media? LG: I really love how public media is an unbiased way to obtain information that is accessible to everyone. It’s really hard nowadays to find a news outlet that doesn’t have some sort of pawn in the game. I think being able to turn something on and receive copious amounts of information and quality content is really great. WCVE: Do you see a career in the design field in your future? LG: Yes, graphic and logo design for sure. It’s just something I think I’m good at and always find interesting. Plus, staying in a field that is always changing with technology is really interesting to me. WCVE: What are you looking forward to most as the new WCVE artist? LG: Mug Stops! It’s going to be really amazing to see my friends and family not only supporting me, but supporting public media as well. I guess now I have to drink 10 cups of coffee a day with all these mugs! To see more of Lathan’s designs, check out his other projects in his portfolio. To purchase one of these gorgeous mugs and meet your favorite radio hosts and reporters, come see us at our Spring Mug Stops!